When the days grow shorter and the weather begins to cool off, I start thinking about making some chili. It’s a protein-packed, warm and filling dish – especially good for those weekend game days. The key to a good chili is in the spices and sautéing your chili spices ahead of time really helps bring out the flavors. 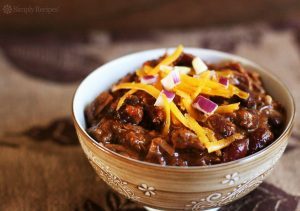 This Yummy Chili Photo is from SimplyRecipes. October is also National Chili Month (who knew?) and as you can imagine, there are a ton of chili recipes out there to choose from because it is a great base to add a signature spin or secret ingredient. From white bean and chicken, to a 4 bean bonanza, some with meat, some without, mild spiced or smokin’ hot, the sky is the limit. I love making batches of my Stadium Apple Chili during this time of year. It starts with chunks of tender pork, lots of spices, onions, a bottle of NW brew, tomatoes and kidney beans. I then add in a chopped apple for a touch of sweetness and let that slowly simmer on the stovetop or in a crockpot until it is ready to serve. I am always sure to make a lot because YOU KNOW it’s always better the next day. You can definitely serve it with lots of tasty toppings too. My top choices are always sour cream, grated Northwest cheeses like Tillamook Cheddar, crisp white onions, and spicy jalapeños. I also like to crush up corn chips to add some crunch too! Ahh, coffee! That first cup o’ joe can usually set the tone for the rest of the day. And certainly the Pacific Northwest is known as THE mecca for coffee drinkers and connoisseurs alike. We definitely love our coffee just as much as our wine with many local independent coffee shops offering coffee “cuppings” – imagine a wine tasting, but for coffee! We all know coffee is so d’lish paired with dark chocolate, but why not get a bit savory and cook with it? 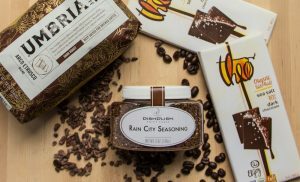 Take for example my Rain City Seasoning: ground Caffe Umbria espresso and Theo Chocolate’s cocoa nibs adds a deep rich flavor to spice rubs. Great on steaks or Alaskan salmon! Or how about adding a cup of coffee to your next slow cooked beef stew or chili recipe, it will add a super-rich flavor to the dish. Have you ever heard of Red Eye Gravy – this was what cowboys made by tossing a cup of cold coffee into their pan gravy. I’ve given it a comfort food spin in my recipe below Red Eye BBQ Sauce – great on everything! On the sweeter side of things, try a little ground espresso added to chocolate cupcake batter for a mocha-licious twist. This BBQ has a lot of ingredients, but that’s what gives it a rich and layered flavor. Double or triple the recipe and store refrigerated for up to 2 weeks. Heat the oil in a heavy saucepan over medium-high heat. Add the onion and sprinkle the black pepper and other dry spices on top. Stir and sauté until the onions are glossy, about 3 minutes. Add the garlic and continue to sauté about 1 more minute. When the onions are translucent, whisk in the remaining ingredients. Bring to a low boil, then reduce the heat and simmer 20 – 30 minutes or until thickened nicely, stir frequently to prevent scorching. If not using the sauce right away, cool and store, refrigerated. 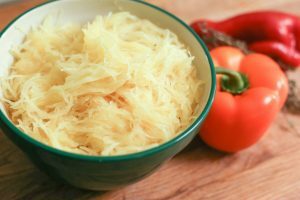 Most people have had a hand at cooking spaghetti squash, and there are a lot of ways to prepare this tasty vegetable. This winter squash starts getting popular at the farmers market and grocery store in early fall. The cooked stringy flesh is delicious, but there are a few cooking tricks to know. Cut the squash in half length-wise. 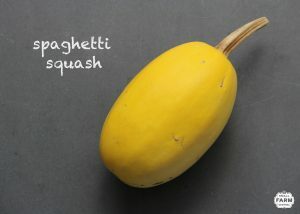 Make sure to use a good knife and a little muscle – this is a sturdy squash! Once you have the squash in half, scrape out the seeds and pulp the same way you would with any other winter squash. for about an hour. You’ll know it’s done when a fork slides in and out of the flesh easily. If you’re in a hurry you can quick cook it the same way in the microwave in a glass dish – just blast on high until fork tender. Now to get those noodle-like strands out of the shell. Turn the squash up and gently scrape the flesh with a fork along the grain and loosen it up. Then scoop the squash into a bowl and finish how you like.